In today’s hazy mazy life where people have paced up with a speed, which is hard to control, at any instance, there are some situations where some think to repent for the guilt they felt over, what had happened in the past while some have regrets about their doings. 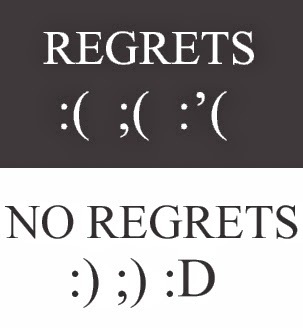 So what actually regret means? In simple and precise words regret is emotional feeling often raised when found guilty in doing what you have done wrong which you could do a way better than what you actually did. Regret is often expressed by the term “sorry”. At times when you do something in different way and then after its completion you realize that it could be done in another different and efficient way than the previous one, that point of realization is known as regrets, since you feel sorry for the situation which aroused after completion of your work. Many of us have regretted in some instances of our life, where we thought things could have been much pleasant then they are now. Regret is intensified by perceptions of future opportunity. It is proposed that feelings of regret are more likely elicited by perceptions of lost opportunity: People regret outcomes that could have been changed in the past but can no longer be changed and for which people experience low psychological closure. How often regrets strikes us? When one may feel a little down, with the fact that thing could have been better if that step would not have raised or stepped back while looking back to the nostalgia. Or when one did not give a deep thought in a decision and carried in a rush. There are evidences likely to occur and beleaguer us by the virtue of deep thoughts and asking question what have done? Why you did so? You could have done something good. These all when strike the brain from different voices keeps on reminding the mistake which one may have done taking decision, doing something wrong and so on. And as a result it ends for regretting. Then what, it will have a bunch of thought rising from every side as a result keeping an end to its confidence in his way of doing. Just stick hard to your choice and decision you have undertaken. Always try focusing in one direction usually many things in mind make a smashup and as a result the prior step is likely to be shaken. So be focused. Just listen to your heart and mind and be calm if you stepped a wrong commitment, and try finding a clear solution for that instead for crying like a kid and regretting. Regret have a positive side too, for instance if you realize what actually one’s mistake was over an issue, decision and you have learned to inculcate that this mistake won’t be repeated it will take you a step ahead. But if you think negatively there are chances to get trapped in your decision rather overcoming to those. However it’s human nature to put more pressure on the thing which are not in our hand and try to make them the way they want, but in reality is not possible to revive things as they were and the way one want, in spite one can have a positive attitude toward their choices, decisions and the steps which they have made with a thought, that, “Everything happens for good”.